As the studio was being constructed, work moved ahead on three more feature films: “Pinocchio,” “Fantasia,” and “Bambi.” Each of these projects was to bring the studio forward in a different way. “Pinocchio” would encourage and enable artists to create an animated world of startling detail and design; “Fantasia” would be a giant leap forward in using animation to picture in a totally new way, via various pieces of classical music; and “Bambi” would bring a new level of realism to the screen, portraying animals with a true-to-life quality that was far more difficult to animate than the cuddly critters that populated Snow White’s universe. As work progressed, however, some of Walt’s staffers were less than happy. They were working incredibly hard and still weren’t being very well paid. Meanwhile, the expense of the new studio and the success of “Snow White” convinced some that Walt had endless resources. He didn’t. In fact, Walt had no extra cash left over, given the large sums he was spending on his new films. When Nazi Germany invaded Poland, thrusting Europe into war, his foreign markets were cut off, and that left him extremely hard up. Matters weren’t helped by the fact that Walt never saw a budget he couldn’t go over. His yearning for artistic realism slowed down the creation of “Bambi” until it was far behind schedule. Production on “Pinocchio” was stopped when Walt decided he just didn’t like the character enough. Solution: Add Jiminy Cricket to the film, as the puppet’s conscience and friend. Though “Pinocchio” was a critical success, the loss of foreign markets and a weaker-than-expected reception in the United States meant it didn’t bring in as much revenue as anticipated. “Fantasia” had problems at the box office too. With 1,500 people on the payroll, the studio soon was $4.5 million in debt. Then a union stepped in to organize Walt’s workers and demand higher wages (they could hardly demand better working conditions than those they already had). Walt saw this as disloyalty from people he regarded as family. He handed over relations with the unions to others — notably lawyer Gunther Lessing. Intransigent union heads clashed with Lessing. Anger and mistrust mounted on both sides. On February 10, 1941, Walt spoke to his staffers, trying to win them over. It was too little, too late. In late May, Walt was hit with a strike. He was deeply hurt by the cruel taunts of picketers. So sick was he of “this god-awful nightmare” that he escaped on a goodwill mission to South America. While away, Elias passed on. By the time he returned, the strike had been settled. But never again would Walt consider his staff an extended family. Business, he now understood, was business. When Pearl Harbor was bombed and the United States was drawn into the Second World War, the nation was in a state of near panic. Americans sat glued to their radio sets to hear the news. Would there be more bombings? Was California safe? That night, Walt’s phone rang. It was his studio manager. “Walt,” he said, “The army is moving in on us. I said I’d have to call you. And they said ‘Call him. But we’re moving in anyway. '” Hours later, some 700 soldiers had, in fact, seized the Disney Studio. Their purpose was to help protect the nearby Lockheed aircraft plant — an installation that was vital to the nation’s security. The next day President Franklin Delano Roosevelt declared war. And for the next eight months, until other provisions could be made, soldiers ate, trained, and lived in Walt’s studio. At the time, Walt was working on “Bambi” — and beginning other projects including “Peter Pan” and “Alice in Wonderland.” He dropped work on almost everything except “Bambi,” which was released on August 21, 1942, a great artistic success. 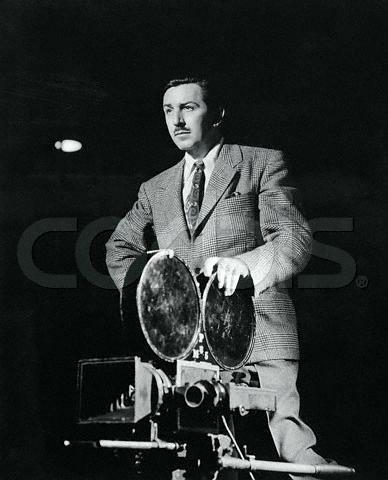 Instead of fairy tales, Walt’s studio made dozens of films for the military. As animation historian Charles Solomon writes, “Prior to the war, the largest annual output of the studio had been 37,000 feet of film; during fiscal year 1942-43 alone, Disney turned out more than five times that amount — 204,000 feet of film, 95% of it for government contracts.” Walt made animated training films and a variety of other civic projects. Notable was “The New Spirit,” a cartoon aimed at convincing Americans that it was their responsibility to pay income taxes. Sixty million people saw the film; a Gallup poll indicated that 37% of them were more willing to pay taxes afterward. Other cartoons “combined propaganda with entertainment,” writes Solomon. For example, in “Der Fuehrer’s Face,” Donald Duck appears as a misbegotten, hungry soul stuck in Nazi Germany. Luckily for the duck, it turns out that the whole thing was only a dream. “Victory Through Air Power” was based on a controversial book by Major Alexander de Seversky. It used powerful images to form a persuasive argument that aircraft would change the nature of war, a concept that was far from generally accepted at the time. It features a powerful finale in which an evil octopus, representing the Japanese empire, is destroyed by a soaring eagle that represents American air power. Though government contracts certainly brought money into the studio, Walt was hardly getting rich from this work. Some of it was done at cost. All of it was pretty expensive. “Victory Through Air Power” lost almost $500,000 at the box office.